There’s nothing quite like the beach, a cold drink, and live music while on vacation! If you’re looking for live music on the Isle of Palms in South Carolina, you’ve come to the right place. Below, we’ve compiled our top recommendations on where you can find the best bands and local music spots during your trip. Planning a trip to Isle of Palms? Begin by accessing our Vacation Guide! It’s completely free and is packed full of information to make your trip planning easier. Inside the Guide, you’ll find the best places to eat, fantastic shopping, and great activities to do on your getaway – like where to find the best live music on the Isle of Palms. There’s just something about live music that completely changes the atmosphere in a place. Whether you’re hoping for a live singer to serenade you during a dinner date or you’re wanting a live band to set the stage for some after-dinner dancing, we’ve got the best places to find live music on the Isle of Palms right here! An unobtrusive building off J.C. Long Blvd, The Dinghy is the perfect place to go for a delicious burger, a cold beer, and live music every night from 7:00 p.m. until 10:00 p.m. They have a great lineup of musicians and a fantastic menu to go with it. If you’re here during the month of February, it’s oyster season on the Isle of Palms and you should head straight to The Dinghy. Every Thursday night at 6:30 during oyster season, enjoy an oyster roast with buckets of oysters, beer, and live music. A beloved favorite of the locals, The Windjammer is the place to be for top-quality music, food, and fun. With everything from packed-out Sister Hazel concerts to Karaoke Night, the Windjammer has something for everyone. They have a full lineup this summer! Grab a cold beer and enjoy the show – like the Ultimate 90’s Tribute on June 2nd, country western Johnny and the Broken Hearts on June 16th, or South Carolina based funk-punk band Uncle Mingo on August 17th. Check out their full calendar and plan for a fun night! They often sell out tickets early, so book now to avoid being disappointed later. Known as the best barbecue around, Home Team BBQ is where you can find fall-off-the-bone ribs, mouthwatering loaded nachos, a full bar, and live entertainment. The beachy vibe and laid-back atmosphere sets a perfect stage for relaxing and enjoying the food and the music. All shows are free and the entertainment usually starts playing at either 8:00 p.m. or 10:00 p.m. Listen to bands like Whiskey Diablo, Sideshow Americans, and much more. Every first Friday night of the month, bring your dancing shoes and spend the evening with Shonuff at Home Team BBQ. 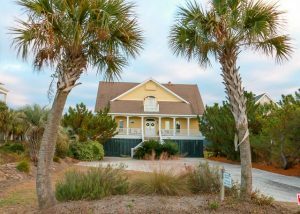 Your Home Away from Home is the Best Way to Experience All the Isle of Palms has to Offer! Whether you are looking for a cozy home for you and your family a house big enough for all the relatives or group of friends, East Island Rentals has a vacation home perfect for you. Enjoy our luxury rentals with our top quality guest services. We can’t wait to help you plan your Isle of Palms adventure! Check our availability and contact us to start planning your getaway today.